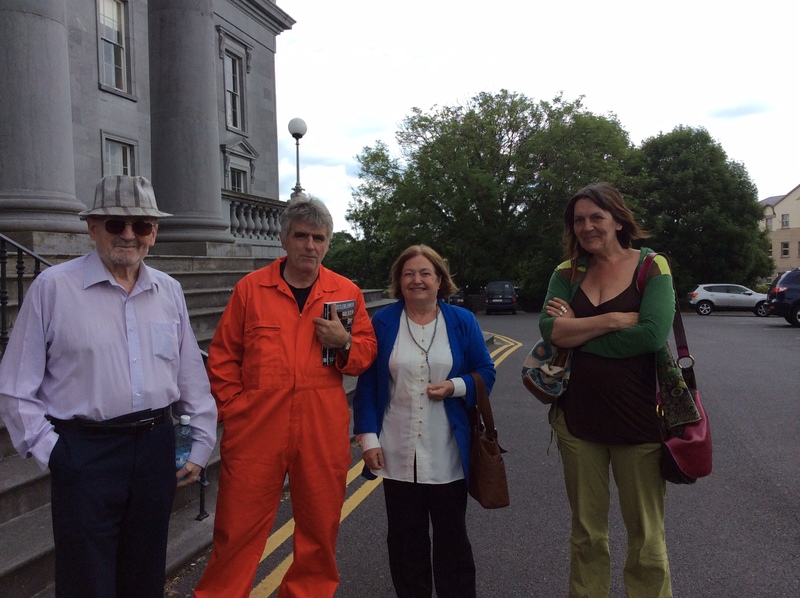 SUMMARY: I arrived in Ennis without pen or notebook to support the action of Margaretta D'Arcy and Niall Farrell who protested on the runway of Shannon against the US military use of the airport. The following is a colour story of happenings on the day relying on memory only. I hope that someone else may provide a fuller report and my apologies for any errors in this report which are entirely my responsibility. Margaretta D'Arcy set the court on fire in Ennis yesterday in the defence of her action of sitting on the runway at Shannon airport with Niall Farrell to protest against US war planes using the Irish airport as a warport for transporting US troops and weapons to war in Afghanistan, Syria or elsewhere. Her witnesses Clare Daly, Tom Clonan, Mairead Maguire, Ed Horgan and John Lannon lit similar fires in her defence. The courtroom was alight with passion and truth. 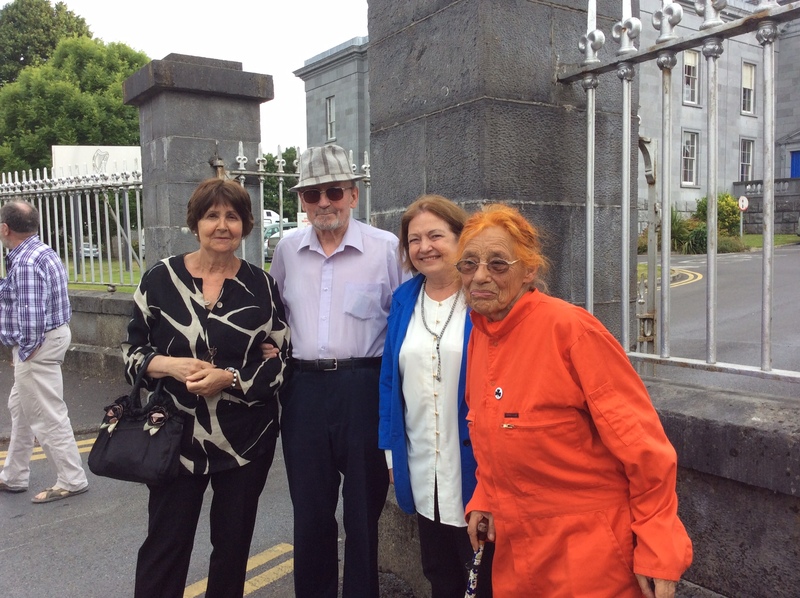 It was an historic day on which Margaretta and her witnesses filled an Irish courtroom with palpable joy. The day belonged to Margaretta and Niall. Their action in non-violently opposing Irish participation in war was vindicated. The court, the State, the prosecuting Gardaí were the big losers. The legal jargon of the court was drowned in the passionate voices of Margaretta and her witnesses. There was applause in court. Not afterwards but during the proceedings. The procedure allowed Margaretta who was defending herself to call her witnesses in the latter part of the trial. One after another they took their seats in the witness box, identified themselves and were questioned by her. The list was impressive. Clare Daly, T.D. who had tried on so many occasions without success to get the Irish parliament to inspect flights at Shannon and stop US military from passing through the civilian airport on their way to war. Dr Tom Clonan, retired Captain of the Irish Army, now security correspondent for the Irish Times who visited Guantanamo and gleaned there the usefulness of Shannon for the US military projection of power. Mairead Maguire, Nobel Peace Laureate co-founder of the Peace People in Northern Ireland who had visited countless war zones on peace missions including Iran, Syria and Iraq, and who knows the situation on the ground there. Dr John Lannon, author, lecturer in Knowledge Management at the University of Limerick, Systems developer, Project manager and Software designer, chief organiser of the Shannon monthly protest. Dr Edward Horgan, retired Army Commandant, researcher and part-time lecturer in the University of the University of Limerick, with experience on behalf of EU, UN, OSCE and Carter Group of election monitoring in Bosnia, Croatia, Nigeria, Indonesia, East Timor, Zimbabwe, Armenia, Ghana, Ukraine, Tunisia and Congo DRC., co-ordinator of Shannonwatch. All five of these these very different people declared their firm belief to the court that what Margaretta D'Arcy and Niall Farrell had done at Shannon was right and proper. Tom Clonan said it was spot on. He had learned that payments for Shannon airport were included in the US Defence budget. He mentioned how a leading member of Hizbollah had told him how disappointed he was that an airport in Co Clare was being used by US military. His knowledge of the location of Shannon made Dr Clonan fear that the airport could easily be a soft target for a terrorist attack. Clare Daly, John Lannon and Ed Horgan believed the protest of Niall and Margaretta was in line with best international law. Mairead Corrigan agreed but added that it it was in line also with the highest law of all, the law of conscience. The judge did not like her perceived inference that he should be lectured on how his conscience might direct him and he told her so. Looking around the courtroom, it was energizing to see so many people of conscience there, themselves victims of legal and Garda injustice, - including Maura Harrington with husband Naoise Ó Mongáin, Pat the Chief O'Donnell and his son, other supporters from Shell to Sea and Rossport, people who have endured long hours and days in courtrooms such as this one with scant heed for their health and safety, let alone their human or judicial rights. Tim Hourigan, recently found not guilty for Shannon surveillance activities, was looking on. Support groups Shannonwatch, PANA and CND were there in force. (Carol Fox of CND was Margaretta's McKenzie friend). Long term human rights and peace activist, Colm Roddy, travelled from Dublin. Ann Patterson had driven from Belfast. Tommy Donnellan was there with his camera, as he is always there, wherever right challenges might, wherever the weak confront the strong. The prosecution wasted a lot of time getting Gardaí to "prove" the fact that everyone knew, namely that Margaretta and Niall were on the runway on the day in question. In the process, something emerged that very few people knew, namely the arresting Garda had handcuffed both Margaretta ad Niall although they were fully cooperative with Gardaí, and Margaretta told the Garda that she had denied her request for water. It should be recorded that Judge Durcan imposed sentences of two weeks imprisonment on Niall and Margaretta, suspended, with conditions attached including the signing of a bond. He admonished the Garda for having used handcuffs on both defendants but did not let this influence his judgement. No-one was surprised. The law of the land, as perceived by the judiciary and the Irish State, had superseded both international law and the law of conscience in an Irish courthouse - as it always does in such cases as these. Two cultures - the cultures of Right and Might - clashed in an Ennis courtroom on an historic day. Might was given the verdict and Right was the winner. Some excerpts from the court proceedings. From the first prosecution witness cross examination. Mark Nicholas (Barrister for Niall Farrell) : How many years have you been an Airport Police Officer? Mr. Nicholas: And you are aware of the US military use of Shannon Airport? Mr. Nicholas: And you are aware that the US has two senior military representatives station at Shannon Airport? APO Flannery agreed under questioning that the two defendants came to Shannon in hi-viz clothing, with large placard and when approached by his boss, they got into his van of their own will and without resistance. .
From the second prosecution witness cross examination. Margaretta D'Arcy: Have you ever search or investigated a US military aircraft, a US military charter or a CIA rendtion plane at Shannon? Judge Durcan: You can make such points, if you wish in your own evidence. Margaretta D'Arcy (to the judge) : I want to know how he does his job. Margaretta D'Arcy (to the witness) : Were you on duty when an armed AC-130 landed illegally at Shannon just 4 days later? Margaretta D'Arcy: I want to know if he arrested the pilot. 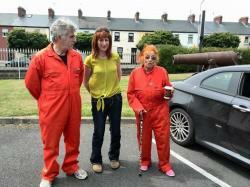 Margaretta D'Arcy: We were on the runway, and you arrested us. Did you arrest the pilot of an armed AC-130? Airport Police Inspector Pat O'Neill: I can't comment on that. Margaretta D'Arcy: That aircraft was not supposed to be there. Shouldn't you have arrested the pilot? Are there two sets of rules? One for people like us trying to stop bombing and one for bombers? APO Inspector O'Neill: I don't understand the question. From the third prosecution witness cross examination. Margaretta D'Arcy: You are aware of the constant opposition to US military use of Shannon? AIrport Police Officer WIlliam O'Brien: Yes. Margaretta D'Arcy: Were you surprised to find people protesting on the runway. Margaretta D'Arcy: But it's not unsual. APO O'Brien: No, it's not unsual. From the fourth prosecution witness cross examination. Margaretta D'Arcy: Do you discuss with the US military reps stationed at Shannon the possibility of protestors on the runway? Airport Duty Manager Ray Pyne : There aren't US military reps currently stationed there, ah, I don't personally deal with them. From the 2nd defence witness testimony. Dr. Tom Clonan was described in court as the security analyst for the Irish Times, a retired Irish Army Captain who served in the Middle East and the former Yugoslavia, and a Fellow of the Inter-University Seminar on Armed Forces & Society. Dr. Tom Clonan : Shannon has a designated military liaison, whose name I won't give here, but it's a Lt. Col reporting directly to the US Base at Stuttgart. Dr. Tom Clonan : "Virtual Forward Operating Base" is a term used by Donald Rumsfeld in 2002, (when he was US Secretary of Defence). He argued that the US Military should sub-contract out some of the logistics functions and spread the costs. In that context, Shannon was identified as a Virtual Forward Operating Base. Since that time, over Two-and-a-quarter million US troops have passed through Shannon Airport., making it the largest invading force to ever pass through the State. Other costs such as the € 17.5 million security cost is charged to the exchequer, and additional air navigation fees. As a direct result of the 'Defence-lite' policy, the Irish Taxpayer makes a substantial contribution to this. Dr. Tom Clonan : During my time serving in the Middle East in the Army I was accutely aware that we were considered neutral. Years later when in the Lebanon I met a paliamentary representative of Hezbollah Dr. Ali el Mekdad. I was attempting to have a chat about Syria when he said "I want to talk to you about your airport over there in Co. Clare. You should be ashamed of yourselves. You are allowing your airport to be used to hurt our people, kill our children. " I would be concerned that if Islamic Resistance Groups like Hezbollah, know of the military use of Shannon Airport, it exposes us to threats, and including Irish troops in the Golan Heights. In a conversation with the US ambassador to the EU, the ambassador referred to 'surprise' that as a member of the 'coalition-of-the-willing' Ireland has no input, that we have 'no representation, though we have taxation ' -through our subsisising of the US military. Margaretta D'Arcy: The Irish Government denies any Irish involvement in rendition. Tell us about your time at Guantanamo Bay and what you learned there about that. Dr. Tom Clonan : At Guantamo Bay, I met a member of a US Intelligence Agency- she would not disclose which agency. I saw various executive type jets on the runway at Gunatanamo, similar to ones that use Shannon. I asked if they used Shannon Airport. She said that they do use Shannon, but would not disclose whether or not they had 'sedated human cargo' on board when they passed through Shannon. Margaretta D'Arcy: Tell us about the phrase "Breaking and Killing". Dr. Tom Clonan : Prior to the ground invasion of Iraq, I was told by a member of the US General Staff, that they would be committing about quarter of a million troops. He said "We're not politicians. We don't make decisions. We break things and kill people. We set up a logistics chain. Shannon is a fulcrum of the logistics ". Shannon is so intergal that is has become part of the US military folklore, the aural culture. Going to a warzone is referred to as "A pint of Guinness in Shannon and then a wake-up". We've seen 250,000 troops go through, what we don't see is the tens of thousands of mutilated injured or the coffins going back. One average, 200 troops would have been, on the day in question at a civilian airport. The Government said that the troops were unarmed and brought no weapons. I was once granted access to one of the flights, A Boeing 757, of North American charter full of US Marines. They were all carrying their personal weapons. It's standard operating procedure to carry weapons. So on the day in question, it's very likely there would have been 200 armed troops at Shannon. That is not a proper use of Shannon Airport. [In response to question from Niall Farrell's barrister] . Dr. Tom Clonan : I spoke to a US Air Force Colonel in charge of KC-767 mid air refeulling tankers. Those aircraft aren't armed, but she said to me in discussion "It's a weapons system, dumbass. The logistics are part of the weapons system. Shannon is part of the weapons system." Mr. Nicholas: Are you familiar with the phrase "Teeth-to-Tail"? Dr. Tom Clonan : It refers to the ratio of logistics support to the front line. In the second world war, it was 5 to 1. For current asymmetrical world wide force projection it's 12 to 1, and that includes Shannon in those logistics. It's considered an integral part of the weapons system. If the shoe was on the other foot, and enemies of the US were using Shannon, the US would consider Shannon a legitimate target. The fact like groups like Hezbollah refer to the role of Shannon Airport means it could be subject to hostile scrutiny at best, and targetting at worst. With the increasing numbers of radicalised resistance groups, Shannon could be a tempting target. I don't agree completely with Margaretta D'Arcy and other people in court on their politics, but I do agree 100% with them in identifying Shannon for what it is - an essential and key component of the US military projection of power. It's corrosive to our international reputation as a neutral state, which we have all benefited from when abroad. Testimony of Clare Daly TD - first witness for the defence. When asked by Margaretta, why she agreed to testify, deputy Daly said that she understood that the courts had already made a ruling regarding the illegality of the US military us of Shannon in the Horgan case, but the courts had refused to interfere with the government policy saying it was a matter for the legislators in Dail Eireann. Clare said that as one of those legislators she has tried repeatedly to raise the matter and along with other like-minded opposition TDs, has encountered great difficulty getting information from the government. The government says that the Army was deployed over 300 times in 2013, but performed no searches, and that this was a matter for the Gardai. When asked where these aircraft were coming from, the government response was that they did not have the information, she said. Margaretta asked if the Dail debated the build up to attack Syria. Clare Daly told the court that a number of opposition TDs proposed a debate on the matter but that it was not accepted as a topic for debate. Deputy Daly said that the Irish state and government are negligent, and that the actions of the defendants put a focus on the atrocities and Ireland's involvement in them. She added that Margaretta's incarceration caused a reaction and a display of opposition, and that it was an act done for the greater good to highlight to loss of life. Inspector Kennedy asked Clare Daly if she was present at Shannon on 1st September 2013. She replied that she wasn't but that she had knowledge of the circumstances in which the act took place. told the court that she was awarded the Nobel Peace Prize in 1976 in regards to work in Northern Ireland starting a peace movement to stop the terrible violence there. That it started with grassroots marches and protests, and within 6 months there was a considerable reduction in violence. Ms Maguire told the court that it took a long time to achieve peace, but it is a wonderful gift. Margaretta asked if there would have been a peace movement without these marches and protests. Ms. Maguire said, that there would not, it had to be built up piece by piece. Margaretta said that the action that she and Niall had taken was in the built up to hostilities in Syria. She told the court that Ms. Maguire had been to Syria. Ms. Maguire told the court she had been to Syria more than once, and that she would like to pay tribute to those who went on the runway for hearing and responding to the wishes of the Syrian people who had asked for someone to tell the world to reject military intervention. She told the court that UN resolution 1325 calls for the protection of civilians, that people have called for debate on this, and that the defendants have done what the Irish government should have done. Ms. Maguire said that Ireland is guilty of violating human rights. She spoke of her time in Iraq, and of visiting the Amiriyah bomb shelter, which was destroyed by two US Air Force GBU-27 laser guided bombs, killing over 400 civilians who were taking shelter inside, many of them incinerated by the blast. Ms. Maguire said we'd helped bomb Iraq, Afghanistan, Libya and threatened to attack Syria and asked, "are we going to allow them to go on doing this forever? Our Government is complicit in war crimes." Ms. Maguire said that the Law of our own informed individual conscience was the highest law, above all national and international laws, and individuals have a duty to follow their own conscience and do the right thing. The Nuremburg Trials established a principle that people who know, and remain silent, are equally guilty. Inspector Kennedy said he had no questions for the witness. The 4th defence witness was Dr. John Lannon, UL Lecturer, Author, Human Rights activist, and a founding member of ShannonWatch. Margaretta asked him if Ireland violated the UN Convention Against Torture. Dr. Lannon informed the court that in each case the aircraft came through Shannon either the day before or the day after these people were snatched. "We don't know for certain if they were on the planes when they came through Shannon, but under the UN Convention Against Torture the victim doesn't need to be aboard in order for us to be complicit. We attempted to bring this to the attention of the Irish Government, that they should not rely on diplomatic assurances in relation to rendition. There were 6 or 7 token inspections, after we made over 100 requests for aircraft inspections. We have presented to an Oireachtas committee details of a sample of 41 specific flights. 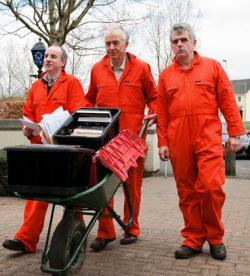 We delivered a wheelbarrow full of data to Shannon Gardai." Dr. Lannon stated "There has been no credible investigation. This is a very improper use of Shannon Airport. " He described the actions of Margaretta D'Arcy and Niall Farrell as very important in drawing attention to an issue that the Gardai were not taking seriously. He continued "We know that the CIA use of Shannon continues and is recent. A suspected CIA jet, registered N997GA used in an attempt to get NSA whistleblower Edward Snowden came through Shannon airport this year. It's extremely important that these things are highlighted, there are breaches of the UN Convention Against Torture, the Hague Convention, and the ECHR. This has been brought to the attention of the authorities repeatedly and no action has been taken. Inspector Kennedy, cross examining asked if Dr. Lannon was present at Shannon Airport on September 1st 2013. Dr. Lannon replied that he was not there that day, but was there in the days before and the days after and was aware of the circumstances in which the action occurred. Dr. Edward Horgan informed the court that he was a part-time lecturer in UL, a former member of the Irish Army who had retired with the rank of Commandant, an expert on explosives, and trained and worked as and Industrial Fire and Safety consultant. Dr. Horgan initiated protests at Shannon Airport in 2001 and has been involved in monitoring and protesting at Shannon for almost 13 years. He took a High Court Case 'Horgan v Ireland' in which High Court Judge Kearns found that there was an identifiable issue in law where a neutral state may not permit the forces of a belligerent state to use its territory. "The Court is prepare to hold therefore that there is an identifiable rule of customary law in relation to the status of neutrality whereunder a neutral state may not permit the movement of large numbers of troops or munitions of one belligerent State through its territory en route to a theatre of war with another"
Dr. Horgan also told the court that he had made personal submissions to a European Committee on Torture and Rendition the EUTDIP committee, as well as two separate submissions to the Joint Oireachtas Committee on Foreign Affairs, and a submission to Joint Oireachtas Petitions Committee a few days prior to this court hearing. Dr. Horgan lamented that 'our actions to date have failed to stop the US military crimes at Shannon'. Referring to his knowledge and training in explosives and fire safety, Dr. Horgan addressed the issues of safety relating to US military use of Shannon. Dr. Horgan outlined that Shannon is not designed as a military airfield and lacks the common features, such as blast barriers, terminal buildings being partially underground, etc. He described Shannon Airport as being 'totally unsuited to military use'. He said that he was aware of prominent cases of US military flights landing at Shannon with safety issues including a World Airways Cargo charter in which the Airport Police and Fire Service were refused access to the aircraft by the military crew handlers, despite the civilian pilot having reported smoke in the cabin. Dr. Horgan described this as a gross breach of regulations. It was notable that the senior members of the Airport Police and Fire Service were still in court at this time, and rather than dispute this evidence they were staring at the floor. Dr. Horgan said that if the Fire Brigade comes upon a fire, they are legally allowed to break in to a house to save people's lives - damaging property in what would otherwise be an illegal act. He said that Margaretta D'Arcy and Niall Farrell were justifiably acting in similar manner on 1st September 2013. He said that he had no doubt that the actions of Niall Farrell and Margaretta D'Arcy were justified and peaceful. Inspector Kennedy asked Dr. Horgan whether he was present at Shannon on September 1st 2013. Dr. Horgan stated that he was in fact present and saw Niall and Margaretta on the runway. Inspector Kennedy asked Dr. Horgan if the defendants were there without permission. Dr. Horgan said the fact that they were citizens of Ireland and had a duty to take action gave them permission. He also stated that the fact that the Gardai had failed to carry out their duties to prevent complicity with torture and other war crimes at Shannon meant that citizens such as Ms D'Arcy and Mr. Farrell had a duty and obligation to take appropriate actions. US cynical murder campaigns in the middle east and elsewhere. 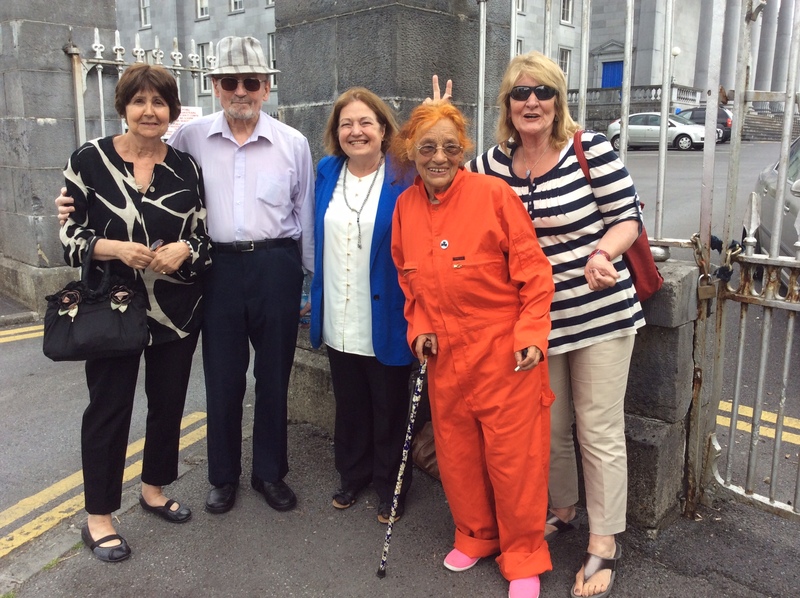 News from Galway is that Margaretta is to go back to jail on Wednesday morning next when she reports at Mill Street Garda station in Galway. Is there any limit to the insanity and immorality of the State that would stand over this second imprisonment of a peace activist who has helped highlight the State's own immoral complicity with the brute militaristic abuse of Shannon civilian airport by US and other foreign powers? Whoever is responsible for this decision must know that it is an Own Goal of enormous stupidity and arrogance. 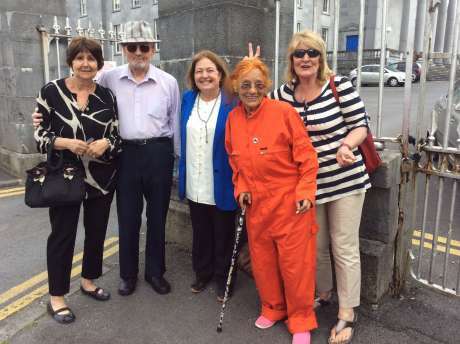 News from Shannonwatch confirms that a protest took place outside Limerick prison on Friday after Margaretta was confined there for the second time. Ed Horgan and John Lannon visited her on Saturday and found her in good spirits despite her serious health condition. Today I rang the prison authorities but they would not give any information about her except that she is still in prison there. They would not say whether or not she has accepted any food as yet. Margaretta's re-imprisonment is unethical, unjust and plain wrong. She and Niall stood up to the Irish State to say in the strongest possible non-violent way that the Irish State continues to allow warplanes to pass through Shannon airport without inspection, and that this is unacceptable. These planes carry troops, weapons and God knows what else on their way to theatres of war. While this seriously woman remains in a prison where sensory deprivation is one of its worst characteristics, th Irish Government uses all its power and prestige to ensure that a Garth Brooks concert goes ahead in Croke Park! The Governor of Limerick prison is on holidays. The prison telephone number is 061 204700. They won't tell you anything but it would be good to let them know that you care.